Catherine Joy Songster (center) mother of Kempis ‘Ghani’ Songster attended the “Community Resentencing” at the Arch Street Methodist Church in Philadelphia on July 23, 2017. 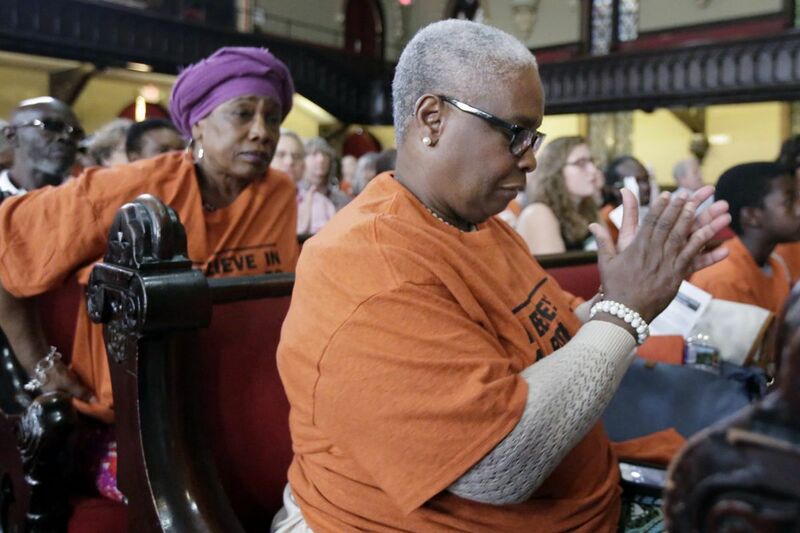 On the eve of a hearing that will determine whether Kempis "Ghani" Songster will be eligible for parole after serving nearly 30 years of a life sentence for murder, supporters gathered Sunday at Arch Street United Methodist Church to consider an alternate view of justice and accountability. The group offered its own versions of an appropriate sentence, one that would be served outside prison walls by Songster, who is now 45 and who family and friends maintain is a changed man. Songster is one of about 2,500 people in the nation convicted of murder as juveniles whose life sentences have been deemed unconstitutional by two recent Supreme Court rulings. Resentencing hearings are underway to decide whether the men and women will be eligible for parole. Some, including about 40 in Philadelphia, already have been released. On Sunday, Songster's friends, family, and supporters wanted to have their say. "We want a sentence that reflects redemptive qualities and is not just punitive," said J. Michael Lyons, an assistant professor of communication studies at St. Joseph's University and a Songster supporter. Lyons was part of a group of about 200 who attended what organizers called a "community sesentencing." For about two hours, the group listened to "testimony" from Songster's family, friends and supporters who say they have witnessed the inmate's evolution in the nearly three decades since he and co-defendant Dameon Brome were convicted of murdering Anjo Pryce, a 17-year-old drug courier. Since his 1988 conviction, Songster, who is now incarcerated at Graterford Prison, has led workshops in cultural awareness, is studying for a degree at Villanova University, and helped found the Redemption Project, an initiative that examines the stories of juvenile lifers and encourages a "revisiting of mandatory life-without-parole sentences." Songster's aunt, Gail Songster, 54, of New York, told the crowd that she has struggled to reconcile the Kempis she knows with the 15-year-old who sold cocaine out of a drug house in Southwest Philadelphia and killed Pryce in 1987. "I believe in a life of redemption, but we can't have redemption until there is repentance and forgiveness," Gail Songster said. About 20 minutes after the start of the meeting, Kempis Songster made his own case through a recorded messaged played through speakers in the church sanctuary. "I am personally ashamed of the role I played in death," Kempis Songster said. "I took another human life. I am so deeply sorry to Anjo." Songster apologized to Pryce's family, his own relatives (about 16 of whom attended the event), and to "young people for being part of the problem." If released, he vowed to be an "agent of hope," in the community. Songster and Brome were 15-year-old runaways from Brooklyn when they began selling drugs for a Jamaican gang from an abandoned house. Locked inside for days at a time, Songster and Brome killed Pryce when he came to pick up drug money, accused them of stealing, and failed to drop off food to the hungry teenagers. Songster and Brome stuffed Pryce's body in the trunk of the victim's 1982 Chevrolet Cavalier, drove five blocks and then abandoned the car, which was discovered a day later by police. In December of 1988, the two teenagers were convicted of murder and sentenced to life in prison. At the Community Resentencing, participants separated into four discussion groups led by recently released juvenile lifers. Attendees decried a criminal justice system that they said was focused on retribution and not rehabilitation. They proposed that Songster be released and required to mentor young people, perform community service, and be available to serve the family members of crime victims. "They should pay it forward," behavioral health specialist Iresha Picot said of the juvenile lifers who are released. "I feel like a lot of times we forget about the families that are affected. They should make peace with them," said Picot, 33, of Southwest Philadelphia. After the group outlined their proposals, volunteers made a list of them, and participants marched them over to the closed criminal justice building in a symbolic delivery of their ideas for resentencing. Songster's mother, Catherine Joy Songster, of Brooklyn, said she is "prayerful and hopeful" about tomorrow's hearing. "We don't know what is to come," said Songster, 61, "but we will be there 100 percent for him, emotionally, financially and spiritually."